Here is the Monday Market Memo for Palmer, Wasilla and the rest of the borough. It’s interesting to see that very little has changed. I would have expected more homes to come on the market. It is very active for this time of year. Note that more homes went under contract this week then came on the market. This has been happening for awhile. Here is the last memo. Market memo. There is a change to this table. The new listing and pending listing numbers are active links…try them! They show you the properties. The market is still very strong, interest rates are still very low. If you want someone to guide you through the process just drop us a line. We have been full time Realtors in the valley since 1991, that’s 25 years. We have watched the changes and kept up with them. We are active in the market and in the community. We would love to help you buy or sell a home. Check out the two homes on the top of the page. In many ways they are very similar. They are both what I call “Hillside Ranches” in that they look like a one story home until you go in and realize that they have a full basement with a door that walks out onto level ground. Also they are in the same price range. The one on the left is 5565 Bonnie. 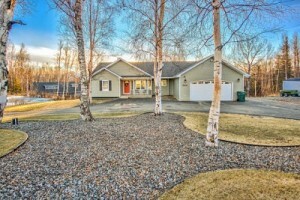 which has 2.2 acres of privacy, 2934 square feet, 4 bedrooms and three bath for $370,000. Here is a video of it. It is located off mile 3 Palmer-Fishhook Road. This is a great location, fantastic commute and right down the road from Hatcher Pass, with biking and hiking trails galore. The house on the right is 5031 Kipling. This house is 3034 square feet, 5 bedrooms, 3 baths on one 1.2 acres for $365,000. This one has a mother-in-law apartment in the lower level. It is located between Engstrom Road And Wasilla Fishhook. Check out the photos on the listing. All info is from the Alaska MLS system. All information is deemed reliable but is not guaranteed and should be independently verified for accuracy.